Today, I am excited to announce the release of my newest book! This book was a lot of fun to create. I enjoyed researching and reading all these vintage advertisements from years ago - many are over 100 years old. 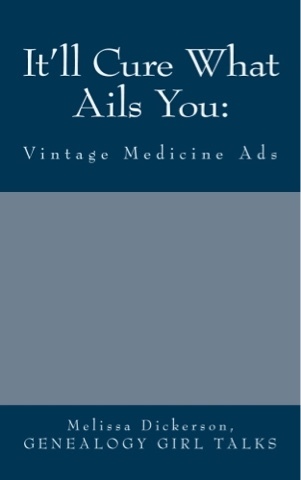 "It'll Cure What Ails You: Vintage Medicine Ads" is a compilation of vintage advertisements from several states within the United States. The ads included in this book are, for the most part, prior to 1900. Some of these ads are interesting, some are comical, and others are a little thought provoking. If you enjoy this timeframe, you will enjoy reading this book! This book is intended for entertainment and educational purposes only. You can also view other books available by Genealogy Girl Talks by accessing my Amazon Author Page. Click the link to view: Amazon Author Page. I hope you enjoy. My newest release!